For months, the Atchafalaya Basinkeeper, a group based in Baton Rouge, has been working to halt work on the Bayou Bridge pipeline out of concern that the project could damage the fragile ecosystem in the Atchafalaya basin. 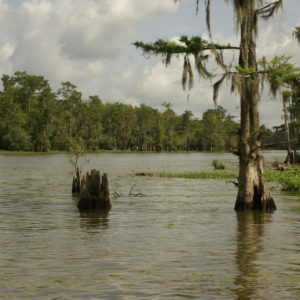 The Atchafalaya Basin covers around 400 square miles of wetlands, cypress, and river delta between the Atchafalaya river and the Gulf of Mexico. Its location on the Gulf Coast means that many pipelines traverse the area, but environmental groups worry that, without proper oversight, this sort of energy infrastructure construction could harm the fragile environment in the basin. As the Bayou Bridge pipeline project approaches its projected October 2018 completion date, Atchafalaya Basinkeeper is continuing to work towards its goal of holding development accountable. “Even if the pipeline is built, and they’re on a pretty aggressive timeline so that might be the case, we can still get meaningful relief,” Misha Mitchell, staff attorney for Atchafalaya Basinkeeper, told InsideSources. The odds of stopping the pipeline’s completion are dwindling as construction progress outpaces the speed of the legal system. Right now, two different lawsuits are preceding against the pipeline project. One challenged the state permitting process for the project and the other was filed on behalf of the community of St. James, where the pipeline will terminate. The St. James lawsuit argues that the majority-minority community is surrounded by energy infrastructure and lacks an evacuation route in case of emergencies. After a few hopeful rulings from courts in Louisiana, the group was dealt a setback when a federal appeals court ruled in early July that construction could continue while the cases progressed. One of the hurdles the group has faced is Louisiana’s unique legal status. Unlike the other 49 states, Louisiana’s state code is not based on English common law. Instead, it has a foundation in French law, specifically the Code Napoleon. “In most common law states we have stare decisis. You get a ruling from a court or a higher court in the state and that is the law….They create a precedent for similar cases later. It is is a little different in Louisana. They don’t have stare decisis. They have something call jurisprudence constante. The relationship between the law and state courts is different,” she says. She explains that under this structure, creating precedent is more difficult than in common law states. This also means that, in some ways, judicial decisions have less impact than they otherwise would. The Code Napoleon is yet another quirk in the long and intricate saga of legal challenges against the pipeline project. The Atchafalaya Basinkeeper, with assistance from the Tulane Environmental Law Clinic, and other groups, is continuing to challenge the project’s environmental permitting and to seek relief for the community of St. James. Even so, they seem to be running out of time. Will all their work be for nothing if the pipeline opens as planned this fall? She says that the lawsuits help to ensure that companies abide by the environmental regulation that the state and federal governments have imposed. Mitchell explains that the group believes that much more is at stake than just one pipeline project. Instead, the Basinkeepers are looking at a the broader picture of how development proceeds in the basin area. Although Bayou Bridge was the most recent project to attract major attention, she explained that the overall goal of protecting the environment and marginalized members of the community still continues. As a result, the group sees opportunities for success–such as better protecting the residents of St. James–even if Bayou Bridge opens on schedule. “It would be unfortunate if the pipeline is built, but we have all these other avenues where we can succeed and we can at least move forward and at least take one step in the direction of protecting our community members. In our eyes, we still have a lot to gain,” she said.